In December 2012, Bill Ackman made a very public announcement: that he and his firm, Pershing Square, were massively short Herbalife, which Ackman and his team had concluded was a pyramid scheme. If all had gone according to plan, Herbalife would&apos;ve been out of business by, say, April 2013. May, tops. But things didn&apos;t go according to plan, because a guy named Carl Icahn stuck his nose where it didn&apos;t belong. Speaking at a meeting of the Council of Institutional Investors&apos; in Washington, Ackman said again that Herbalife has caused "enormous harm to a very vulnerable population" by targeting undocumented Latinos in the United States and other poor people...Ackman said that when he first bet against Herbalife, he had not anticipated that another billionaire investor, Carl Icahn, would come in, take a long view on the company and "go on CNBC once a week saying how great the company was and how bad I was." Had Icahn not shown up, Ackman said, the whole thing would be over in a few months and Herbalife&apos;s alleged pyramid scheme would have collapsed. • Going on Bloomberg TV and saying: "I have no respect for him and I don’t like him and that’s not a secret"
• Describing him, during an interview on CNBC, as "a crybaby in a schoolyard"
• Telling Ackman, in the same CNBC interview, "I wouldn’t invest with you if you were the last man on earth"
NO MATTER. 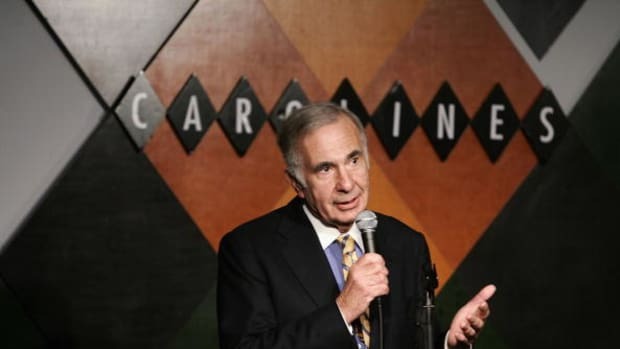 Despite Icahn&apos;s meddling, and taunts, and barbershop quartets hired to sing Herbalife&apos;s praises in front of Pershing Square&apos;s offices, Ackman is confident he&apos;ll be speaking at Herbalife&apos;s funeral in due time. Ackman...said that shutting down the company is "one of the most important things" he can do.